Falconry is the sport of taking wild prey (or quarry) in its natural state and habitat by means of trained hawks. It has never been easy, and the present day conditions add many obstacles to the achievement of success in the sport. Mere enthusiasm, momentarily fired by the sight of trained hawks being flown to the lure at a Country Fair, or on a TV programme, is not an adequate base from which to launch oneself into this most difficult of sports. 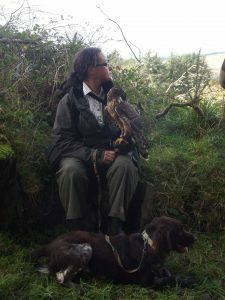 A great deal of dedication and study is needed before a beginner gains a proper understanding of how to manage a hawk. Many falconers choose both their livelihood and their home so that they can have proper opportunities of following their sport, and they sacrifice many other interests to do so. Nobody should acquire a hawk without first receiving proper instruction in how to keep and handle it. This is said with the interests and welfare of the hawk much more in mind than any of the difficulties or frustrations an ignorant handler will experience. A hawk that is not treated with proper care becomes a pitiable object, wild, frightened, her wing and tail feathers broken and caked with dirt, and a disgrace to the proper traditions of our sport. A hawk requires special accommodation and special fresh raw food every day. A hawk is not like a gun or a fishing rod which can be stored in a cupboard when it is not wanted. She requires careful handling for which the time must be available. She cannot be left to look after herself when her owner wants to go on holiday or falls sick. Hawks do not make good pets and they do not accept being fondled or made a fuss of. The British Falconers Club is not willing to advise or assist anyone who does not want to fly hawks properly and fairly at wild quarry. Experience has shown that young people seldom make a success of training a hawk on their own. 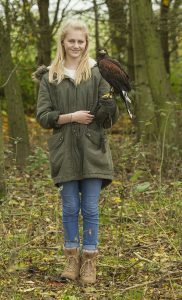 The British Falconers’ Club regretfully recommends that youngsters under the age of 16 years should not keep a hawk unless they have the continuous assistance and friendship of an experienced falconer – an ‘experienced falconer’ being somebody with at least five years practical experience of success in the field with hawks. Youngsters are welcome as Supporter members of the Club and for a small annual subscription a supporter receives three excellent publications each year containing much useful information. A beginner is more likely to meet such a mentor if he joins the British Falconers Club, but the demands are often heavy and it must be said that instruction in this particular way comes to only a lucky few. The British Falconers’ Club recommends that the beginner, after studying the necessary basic knowledge, should start by training either a Harris Hawk (Parabuteo unicinctus) or a Red Tailed Hawk (Buteo jamaicensis). Both are very capable hunting hawks in most types of countryside and will take a variety of quarry. 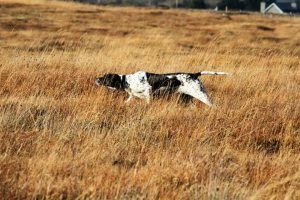 Other traditional species such as goshawk, sparrow hawk, peregrine and Merlin are either harder to train or require specialist countryside in which they may be flown (eg heather moor land, downland plains or fen country). Older falconry manuals recommend training kestrel but they rarely take acceptable quarry, and due to their small size, fatal mistakes can be made when bringing them into flying condition. One hawk is more than sufficient for most falconers, and certainly for all beginners. The quarry available to falconers in Britain – hares, rabbits, game birds and birds excluded either wholly or seasonally from the protection by the Wildlife and Countryside Act. (The schedules to the act and the Game Laws should be consulted). Hawks moult their feather during the summer, and are flown during the autumn and winter months, when many people working full time are not free to go out during the hours of daylight. The beginner should take this into account and ensure that he has sufficient time available in which to exercise and hunt with his hawk. The falconer must have full legal access to a large stretch of country: he cannot select a suitable place and fly his hawk without the landowner’s or farmer’s permission. 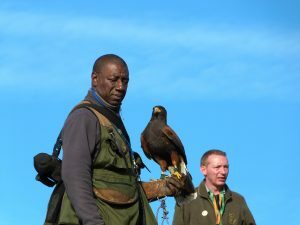 An experienced falconer chooses his hawk in accordance with the sort of country ( either open or wooded) over which he has permission to fly it and the quarry available. Far too many would be falconers imagine themselves starting with a peregrine – if not several peregrines! In fact there are extremely few falconers who have the leisure and the open countryside necessary to do justice to a peregrine, quite apart from the considerable experience needed to fly such a hawk. The sparrowhawk is the most difficult of all hawks to manage. Nobody should attempt to handle one until he has successfully flown and taken quarry with at least one other hawk. All British Birds of Prey are protected by the Countryside and Wildlife Act, 1981. The act empowers the Secretary of state for the Environment to grant licences to take hawks from the wild for the purpose of falconry or to import them, but at the present time very few licences are issued. Taking or importing a hawk without a licence is an offence punishable in the courts, and The British Falconers’ Club will not hesitate to report any such action to the proper authorities. A member of the Club found guilty of such an offence would be expelled. Incalculable damage has been done and is being done to the reputation of falconry and falconers all over the world through illegal thieving of wild hawks and their eggs by operators, who smuggle them from one country to another and sell them on the black market. The difficult provisions of ringing, registration and inspection have been imposed upon falconers in an attempt to stop this iniquitous trade. Hawks are now bred in captivity and the beginner should expect to start with a captive bred bird. Some of these hawks which fall into the category of needing particular protection have to be ringed and registered with the Department of the Environment. Captive bred hawks are regularly advertised for sale in the Avicultural Press, but the price and condition of these vary. The would be falconer is most strongly advised not to start by wondering how to get a hawk, but to attend an approved course or as a minmum study the books listed in the approved list.